What a great time in Cambridge last night! We made good driving time, and met up with my brother, Ed, who got to experience his very first poetry reading (and I’m pretty sure was not scarred for life by it, or at least not in a bad way). It was the perfect introduction, actually. Kevin Barents began us off, and he had a wonderfully animated style that really carried us into his persona poems, and then Chloe Garcia-Roberts read. She has a soft, inflective voice which my husband compared to eating chocolate flowers. To which I’d add chocolate flowers whose centers hide little frosted barbs. I read last; the audience was very responsive and attentive and friendly — many came up afterwards to tell me how much they enjoyed my poems, which is the best, these off-the-cuff and honest reactions. The reading was followed by mochas and long-overdue conversation with a dear college friend (thank you, Facebook!) who missed the reading but caught up with us after. Nothing could have closed my evening better. I’m looking forward to reading more of Kevin’s & Chloe’s work out there in po-world — big thanks again to the multi-talented Andrea Cohen, director of the Blacksmith House Poetry Series, for the invitation and getting me out into the big city, or, as Vincent would say, Busy Town. Oh so tired today, but still smiling. This will the first time I’m reading with poets I don’t know, whose work I’m unfamiliar with, though I of course Googled them to get a taste — because I’m a do-my-homework kind of girl — but it sure adds an extra element of excitement to choosing my set list. Which I still have to do. In addition to the poems and Words in Air, I’ve finished the Ian Hamilton biography of Lowell and Brett C. Millier’s biography of Bishop, and I’m about to start on Paul Mariani’s biography of Lowell — because yes, as it turns out, one is not enough — I’m also looking for what else I can read on Bishop. Both lives strike different chords in me, make me sad in different ways, and I want to talk about that, but I have too much to do today before we leave — it’s a bit of a drive for us to get to Cambridge — so it will have to wait. And I’m far too nervous to be able to contruct an articulate thought anyway! With any luck, I’ll be able to post a favorable report of my evening tomorrow. If I’m going to participate in NaPoWriMo this year, which is by no means assured, then I may have to stop writing for March and begin working on a game plan. But that’s another post. Today’s poem used some words from a wordle ReadWritePoem prompt. Only some words. But they were a big help in narrowing my focus, so my thanks to them for another solid challenge. As usual, this will stay up for a short time only. Any & all comments are welcome. 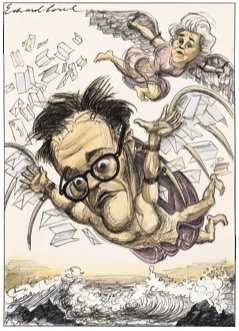 NEW YORKER illustration from review of WORDS IN AIR. Writing this last cento using poems by both Lowell and Bishop was the most gratifying of work. Putting their voices, these two poets who were such good friends, in direct dialogue with each other gradually took on more and more significance for me. It feels like a Valentine of sorts. Thanks again to Carolee and Jill over at ReadWritePoem for the cento education! This’ll come down in a couple days. Hope your Valentine brings you chocolate. I find writing centos a very absorbing process. I’m a crossword puzzle fiend thanks to my former bookstore boss, so drafting centos definitely appeals to that part of my brain. And I can see where working with centos could inspire you and get you started on a poem entirely your own. But what’s better, centos really focus you on all the smaller moving parts of a poem. It’s like taking apart that engine in shop class to see how it works, and then putting it all back together, only now you’re the engineer and can design a whole new machine. And working with single-poet centos forces you to engage with his/her poems in a completely unfamiliar and illuminating way. Recurring themes, word choice patterns, images, even something as basic as blocks of syntax — you live within the poems more through your study of them. I feel particularly conscious of this because of my Lowell/Bishop reading project. As much as I felt they differed when I began is how much I can see now that they share. It’s misleading at first because Lowell wrote so much, and his style and concerns changed much more than Bishop’s over the years. I found writing my Bishop cento initially much more challenging. But patterns have emerged, and I’ve already begun the Lowell/Bishop combined cento. I’m excited to see how that turns out. For now, below is the Bishop cento; it will remain up until the next, and last, cento is up, probably Friday or Saturday. Many thanks to Carolee and Jill over at ReadWritePoem for coming up with this challenge! Draft of the Week, #14. 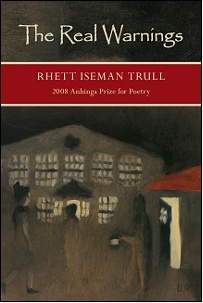 I was lucky enough to spend two whole days with Rhett Iseman Trull, and what fun we had. We talked poetry, literary journals, played with the boys… and Lance made gumbo! Which we wolfed down, starved after our intersecting journeys. First thing when we stepped out of the car after arriving from the airport, Rhett looked up and spied a bald eagle. Truly! (We discovered later that he’s a regular—Lance always knows these things—called the “Bridge Eagle” around here, because he hovers around the bridge, fishing in the river. Which he can’t do right now, due to its current frozen state.) Sadly, that was the eagle’s first & only appearance to us—if he’s smart he lit off for better hunting grounds. 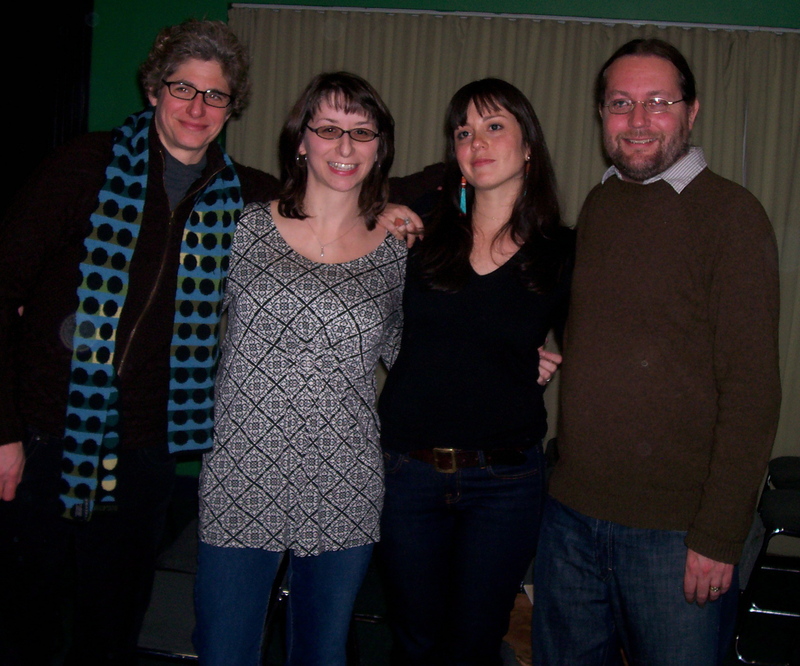 Rhett & Meg both read wonderfully; they were a great match-up, full of spark & personality, and we had a packed house. After such a lively poetry party, I had a hard time settling into sleep that night. Hooray for me, I had Rhett again the next day when the wacky weather played havoc with her travel plans. More poetry talk, more playing with the boys—Rhett’s a total wiz with kids, Vincent & Aidan adored her—until it was time to bring her back, however reluctantly, to the airport. I already miss her softly Southern lilt, and look forward to seeing her again sometime, I hope, in the not too distant future. On another note, Carolee and Jill over at ReadWritePoem have named their poetry mini-challenge for the month, and it is “Fall in love with a poet”, cento-style! Check out their post here to read more on this form and what this challenge is all about. Per the rules, I have altered very little: capitalizations, punctuation (though less than you might imagine), one verb tense, and I added one preposition. Not quite a pure cento, but pretty damn close. Because I’m in the midst of a Lowell/Bishop kick, and because I can’t seem to follow a prompt without customizing it (sorry! ), my plan is this: on day one (today) a cento from Lowell; day two (tomorrow, maybe Thursday), a cento from Bishop; and on the last day (Fri/Sat), a combined Lowell/Bishop cento. As each new poem goes up, the previous one will come down. Comments, both yays and nays, are always welcome. 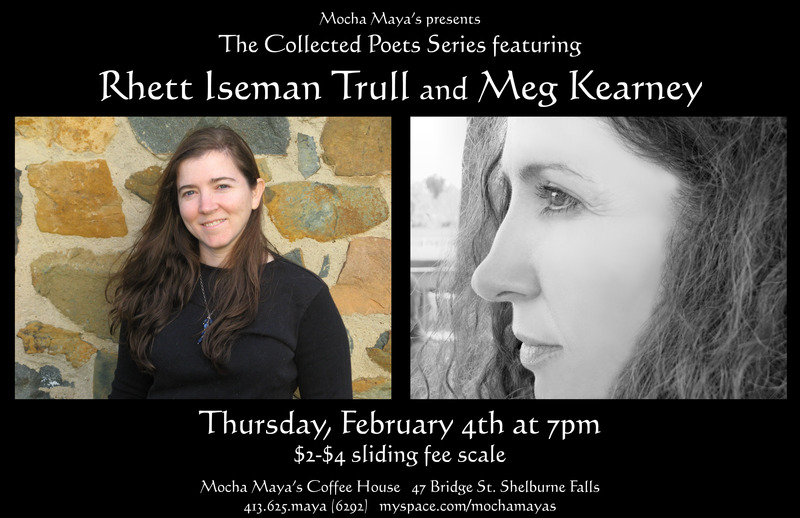 This Thursday, February 4, at 7:00 pm, the Collected Poets Series welcomes poets Rhett Iseman Trull and Meg Kearney. For more information, please check out our (new & improved!) website: http://collectedpoets.com. Anyone who follows this blog with any sort of regularity will know why this is a reading I’m especially excited about. Rhett is the phenomenal and phenomenally generous editor of Cave Wall — generous with her time, generous with her praise, generous with her support. I’m simply thrilled that we’re hosting her. I’m introducing Rhett, and I can see I’m going to have to rein myself in — nothing more annoying than an introduction that goes on and on and on. If you’re in the area, please come out and join us — this is going to be one special evening!